Melissa, from Mel’s Own Place put together this fabulous Owl Plushie Tutorial. It’s just so cute! The tutorial is very well written with lots of easy-to-understand photos. It’s sure to make some little one smile. Thanks for suggesting this tutorial. 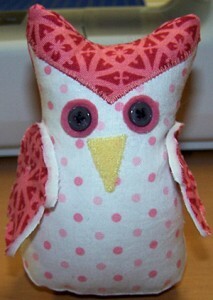 This owl might make a great good luck charm in the sewing studio. .-= Dena’s latest post: Oh The Treasures Around Me… =-. Hi! Thanks, Michele for sharing!! .-= Mel’s latest post: Linen or Gift Bag Tutorial =-.